Professor Kim is especially interested in minimally invasive colorectal surgery during the past 20 years. He obtained a research fellowship for colorectal laparoscopic surgery at the Department of Colorectal Surgery of the Cleveland Clinic Foundation, Cleveland, OH in 1995-1997 and received the outstanding surgical research fellow award. He has performed more than 2000 laparoscopic colon and rectal operations mainly for cancer. He started the robotic rectal cancer resection in late 2007. He developed single-docking fully robotic low anterior resection and performed around 500 cases using this technique. He has been doing many live robotic and laparoscopic surgeries demonstrated at various international congresses, and telecasted to oversea hospitals. 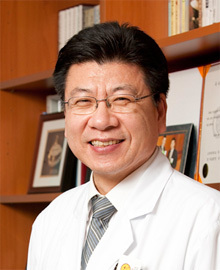 Professor Kim is currently the Chairman of the Korean Society of Endoscopic and Laparoscopic Surgeons (KSELS, 2014-2016), and the President of Korean Association of Robotic Surgeons (KAROS, 2013-2015). He is also a visiting professor worldwide.